Following on from my post the other day, here's some more information on how my January Style Challenge will work. This month's challenge is to focus on finding just 5 classic essential items in the January sales. These items must fill gaps in my wardrobe and also give lots more mileage to the items I already have. I'm as guilty as most for going into the sales and buying a bit randomly - items I like and that are well reduced mostly. And I have a tendency to go for bright colours or patterns and forget that the sales should be about looking for more classic items that your existing wardrobe can work around in order to give yourself more overall options. My items are also based around my 2014 wardrobe resolution to dress down a bit more, so a couple of them are a big move away from my comfort zone - I want to push myself to try some new looks! 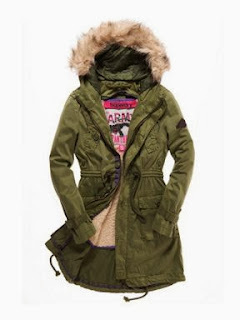 My first item is a khaki green cotton parka. Now I've wanted one for these for ages and to date, have bought 5 and sent back 5 because they just weren't ticking the boxes I had. Now I know I have my navy Target Dry parka that I really do love but the truth is, I wear it ALL the time and it's a bit more functional than the one I'm looking for now. I'm thinking the khaki will open up a few more colour options for me and it's also a bit more along the 'dressed down' lines. Here are a few options out there...some I have bought already and returned and others that were on the wishlist but out of budget. 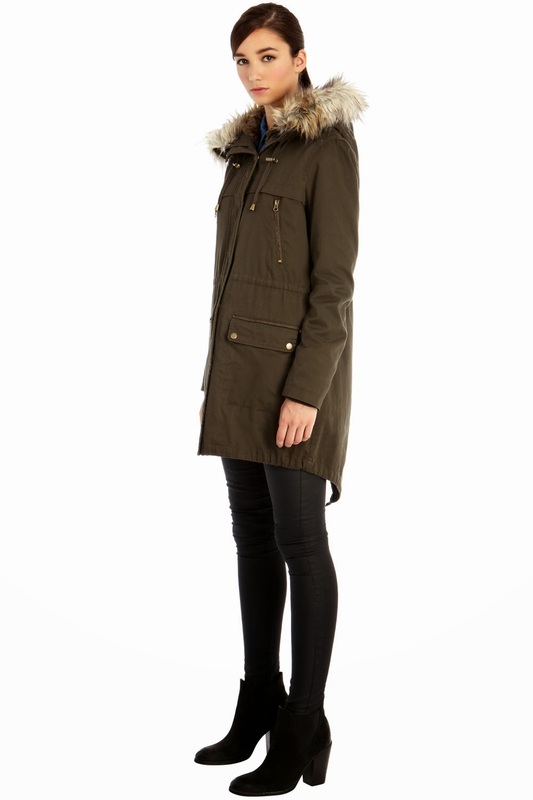 First up, one of the latter category...this fab Superdry one is exactly what I wanted. The furry lining is just gorgeous - I've seen it in the flesh. But why on earth do they not have a sale in Superdry? It just puts me off a brand if they see themselves as being above having a sale so on principle, I didn't try it on...though truth is, I knew if I did, I would have wanted it. 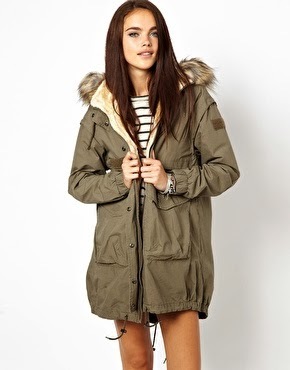 Next up, ASOS has been the source of several parka orders. Bless them, they really do have the best returns service which I've availed of often. They could show a few brands how to do online retailing better. But now a couple of more affordable ones, starting with the one I most recently sent back to ASOS - from River Island. It was the perfect colour and a good price but I wanted a bit more shape at the waist and pulling the cords didn't work so well. I also wanted my khaki to be a bit darker and the fur inside to be less creamy coloured. Fussy much? This next one is a total bargain and I'm regretting not ordering it. 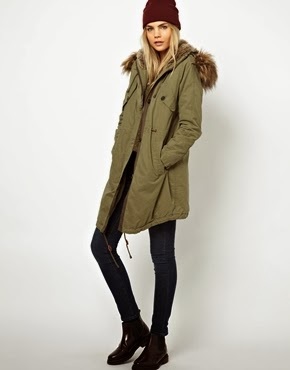 It's from Vero Moda and is only £35.50 in the sale...sob! I'm really pleased with it - here I am wearing it today in a dressed down outfit when we braved the storms to go to the park. The kids were seriously in need of fresh air and exercise after a morning stuck indoors. Boots - Mango..in the sale! and there you go - item one...in the bag! Now, onto item two...not proving as easy to find. I'll update you early next week! Now over to you - link up here if you've done a January Sales Essentials post already. Don't worry if you haven't - I'll have a linky on each post from the January 5 essentials. I have two parka's they are virtually identical but I'm a sucker for them! Happy New Year Avril (I'm a little bit late but I've not been around). 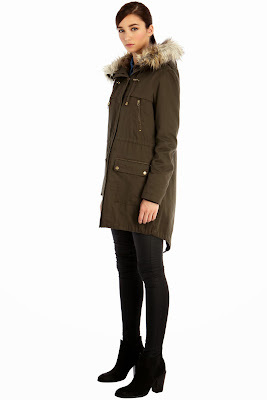 Well, I love a good parka and I have to say you've picked a goody. And I love this more subdued palate probably because it's a little more me. And funny how you're toning down - I was just thinking that I should colour up a little this year having just had the Mick taken out of me for the last few days over my grey, grey and more grey outfits from friends. But it's hard to teach an old dog new tricks eh? This is fab. Got Joe a parka for Christmas and so want one to match! Love the idea of the linky - just added my sales post - although it's probably all sold out now! 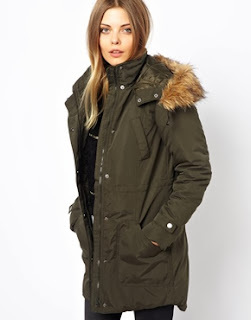 Love my parka - mine is from Littlewoods 7 years ago so I could probably justify a new one but I love it so so much that I can't ever find one that I like as much. Duh. It's not exactly waterproof but so thick I never get wet..
Love the parka Avril....I tried on the RI one also but decided on a short wax casual jacket instead. Added my link above on the sales edit but mine is only a small piece on basic tops... might appeal to someone though!